My mother, Leoda Floradene Hall Wagner, walked on Sunday morning November 27, 2016, right on through the veil between this life and the next. I knew she was fading and ready to go. When it was clear Alzheimers had captured her brain several years ago, I said goodbye and told her to go when she was ready. I was off in Death Valley exploring with a group of friends and out of cell contact. We woke up on Sunday morning to high winds and packed up to head out. It started raining on us - in one of the driest places around mind you. We drove out and up into the nearby mountains to explore an old mine and right into the most beautiful snowfall I’ve ever seen. When we got out of the truck it was still snowing lightly. I wandered and played and took pictures and sketched. Only later did I learn that right about then was when Mom was breathing her last breath. I will always remember the beauty of that morning – it was a gift. Two nights before I had hiked up a hillside into a wash in the desert and talked to her. Telling her about my man and our love and how we were doing, what her granddaughter was up too. Just catching up on things. It was peaceful and I could feel her around me. I told her again to go when she was ready. When I left I found a little rock in my pocket with a brilliant green streak through it – one of the colors she used to wear. She and I traveled to Ireland, with a side trip to London, in late spring of 2006 – our big trip together as mother and daughter. 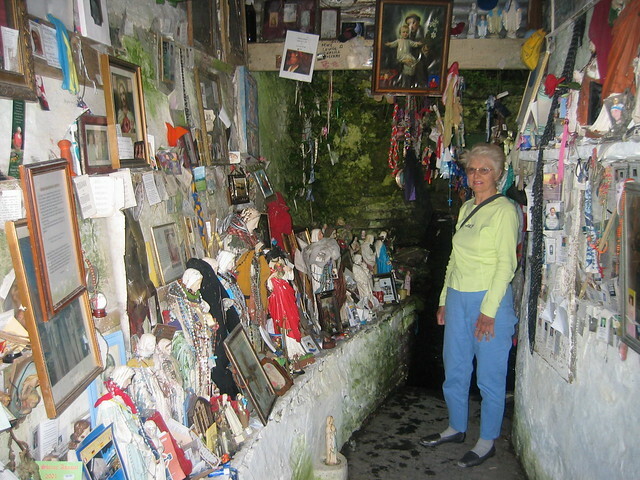 Mom loved traveling especially to see sacred sites. I spent 4 months researching the trip, mapping out what stone circles and cairns to see and where to stay. We were gone almost 3 weeks on our travels. The longest I had been gone from my very young daughter. I taught my mom how to use a camera phone to take pictures to send back to her granddaughter. We began our trip by visiting London and going to the Tower of London to see the Crown Jewels – something she had always wanted to see. It rained on us as we wandered all over London. Then off to Dublin. We saw Newgrange and its sister cairns, Knowth and Dowth, staying in a B&B next door that served fried tomatoes for breakfast. We found Ramsey tombstones in Letterkenney and got lost trying to find stone circles and cairns hidden off the road. We stayed in all kinds of places including on the estate of a Lord where a Templar ruins still exist. We went up to the top of Maeve’s cairn and part way of St. Patick’s mountain. It was an adventure full of memories. Mom was always interested in all things mystical. She had the gift of Sight; you could place your hand in hers and she would close her eyes and she would answer all the questions you were too afraid to voice. And then some. She wowed my friends and made it very hard to hide anything when I was a teenager! One Thanksgiving, about 12 years ago, we talked about having this gift. My grandmother, her mom, had the Sight. Mom remembered as a child her mom coming to the breakfast table with dreams to share – her way of sharing her gift in a world that did not support women with the Sight. In my moms world, she became a “psychic” thought she never asked for money and never had one of those neon signs. We would laugh about that. I know the gift is in me too but different then how it was for her. I was very rebellious when I was younger and still am I suppose. When I was born, Mom was delighted to have a baby girl after two boys and dressed me up in pink and bows and dresses and tried to make me into a lady. She painted my room pink every year until I protested and painted it brilliant orange. It took 3 coats of white to cover it when I moved out something that I admit still makes me smile. Amusingly, hot pink is now one of my favorite colors. Mom loved dressing up and fashion and shopping. And when she was shopping she walked FAST. I learned to always keep my eye on her so I didn't lose her when we were moving through a shopping mall. She had her colors done and liked it so well she had mine done. She was making me wear rust and brown colors and it turned out my colors were black and rose and very pale blue and pine needle. Had to completely redo my wardrobe. My jeans and t-shirt phases were a trial to her. Then there was the old turquoise cape coat she really didn't like which disappeared from my closet one day and resulted in a very heated argument between us. She was proud of me for my career and for the things I created including being an artist. And as the years went past I realized I was proud of her too. Every place she lived she joined the local womens' club and always became the president involved in all sorts of charitable activities. She was an compassionate real estate agent who helped her clients relocate, size down gracefully and move through the challenges of change. I remember when I bought my little black Porsche. My dad’s reaction was shock. He literally could not believe I could drive it. Women just were too helpless to do that. My response was to take Mom for a drive in the mountains which she loved – laughing the whole time as I flew over the windy roads. She was there when my daughter was born. She was so happy to hold Eleanor. She stayed with us for two weeks to help out and it was a gift. She did laundry, made sure I slept and ate and held Eleanor every second she could. When I had troubles with breast feeding, she couldn't help and shared her stories of how the doctors dried up women without even asking in the 50s. When Eleanor was small, she loved her grandma and made her play dress up with her all the time. They played with kittens and blew bubbles and we visited down at their house when we could. Unfortunately, the Alzheimers started to take her away when Elle was still young and now Elle doesn't remember that much of Grandma. 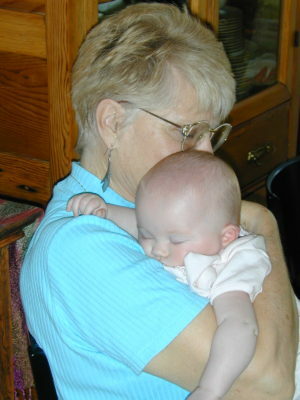 My one regret is that Elle could have had more time with Grandma when her mind was still with us. I’ll miss her and I can feel her with me. Its odd. I am sad but mostly peaceful with her passing. Its been a long time coming. When I did my prayers this morning I could see her smiling face the whole time so very clearly. In a way she is more here now then she has been and that feels good. Am I Still Holding My Piece of the Red Thread?